Are you always on the lookout for new ways to get the wheels of creativity turning in your young learners? What better way than to start with a beloved book character? Pete the Cat has likely stolen the hearts of your youngsters already with his groovy adventures, fun friends and positive attitude. Use this enthusiasm to inspire students to be creative! 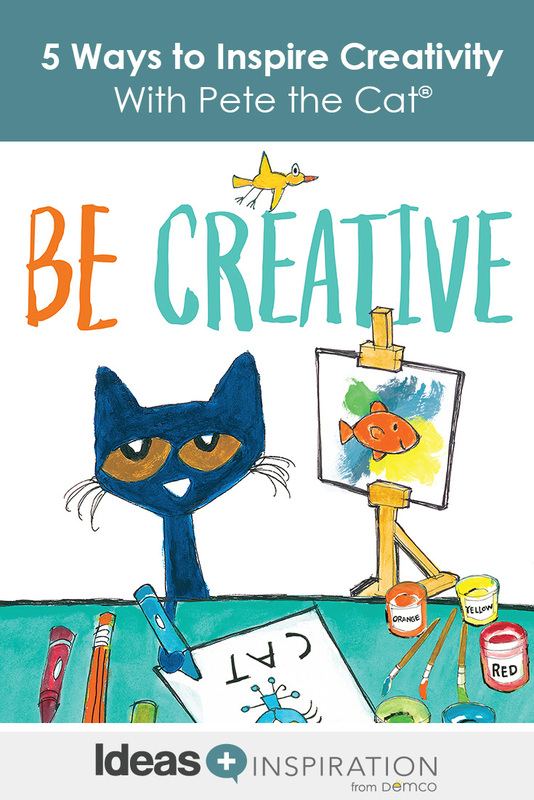 Reproduce the shoe pattern on page 5 of Upstart’s Celebrate Year-Round with Pete the Cat Activity Guide. After reading I Love My White Shoes, challenge students to think of places Pete might go for a walk, and what might happen to his shoes along the way. For example, if he went for a walk at a carnival, he might step in cotton candy, turning his shoes pink (and sticky). What about a candy store? Or the beach? Give each student a copy of the shoes, and have them color the shoes according to their ideas of what Pete stepped in. Have them write a sentence to go along with the shoes, or have them dictate their ideas to you. In Pete the Cat and the Treasure Map, Pete discovers a treasure map and sets off to find hidden treasure. Tell students to imagine that they have found a treasure map. Where would the map lead? What obstacles do they have to overcome to get to the treasure? What is waiting for them at the end of the journey? Tell students the treasure could be anything — the sky is the limit! Have students write down their journeys and draw a treasure map, complete with landmarks, to go along with their stories. Or, students can draw pictures and dictate their stories to you based on their drawings. 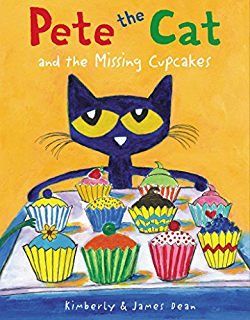 In Pete the Cat and the Missing Cupcakes, Pete and his friends have worked hard baking cupcakes for a party — but some of them disappear! Using Pete’s Cool Cupcakes printout, cut out and hide cupcakes around the library. After students find a certain number of cupcakes, they can color and decorate them any way they choose. Have them turn in one of their cupcakes for a small prize. As an extra challenge, have them write down words to describe their cupcakes and then share their creations with the rest of the class. We do too! Upstart’s Pete products will brighten your library and get young learners rocking in their reading shoes! 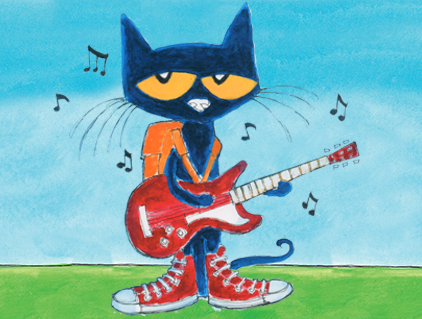 After reading Pete the Cat and the Cool Cat Boogie, learn the dance steps in the book, or print out the official steps to the Cool Cat Boogie. Put on some music and dance! Then, pair up students and have them create their own dance moves to share with the rest of the class. You might even want to hold a dance-off event! Send out invitations, serve refreshments and boogie away! You can also watch music videos at Pete TV. Pete has lots of friends — Squirrel, Turtle, Grumpy Toad and more. Tell students to imagine what new adventures Pete might go on with his friends. Where do they go? What songs do they sing? What lessons do they learn? Have them write down their ideas for a new Pete the Cat book that includes at least two of Pete’s friends. Then, give each student a copy of Pete from page 4 of Upstart’s Celebrate Year-Round with Pete the Cat Activity Guide. Have them write the title of their book on the book in Pete’s hands and color the page. Display all of the book ideas and have students explain the title they came up with. 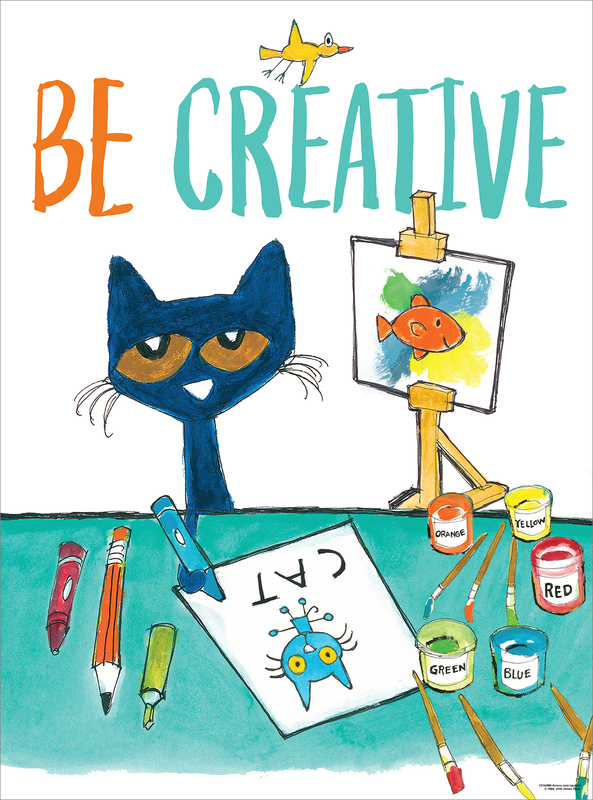 For more groovy and creative Pete the Cat ideas, check out Upstart’s Celebrate Year-Round with Pete the Cat Activity Guide, Pete’s official website, and Upstart’s Pete the Cat Pinterest page.